Let me tell you a little more about it…lots of my subscribers are cardmakers, and some have discovered their own previously-undiscovered talents at drawing. This class is for both, but in different ways, so let me tell you a little bit for each. You CAN take the class, watch the videos and see how the various types of light are applied and get much out of it. Just seeing a picture come alive and being able to understand the light in it has great value. But in this course, I’ve included a very short video in each lesson applying that type of lighting concept on a stamped card scene. These are NOT coloring technique videos – but they’ll show a little how you can use that kind of lighting in your cardmaking scenes. You don’t need to have the stamps for class (they’re not listed in preclass lesson–they’re within each lesson itself), but you can see a peek at them in the video below.) –you can look for stamps YOU own and find a scene with that type of lighting – ie a sunset with long tree shadows, or a stamp with any kind of open bowl or cup shape to create interior shading. The stamped examples in class have ONLY the shadow portion in the video, for most of them – so please don’t take this course expecting to get lots of crafty videos. But you will likely get a decent amount of education out of the course anyway, if you apply the learning. Once some other folks take the course, they can also post reviews telling you if they think it’s worth the cost if ONLY a cardmaker. 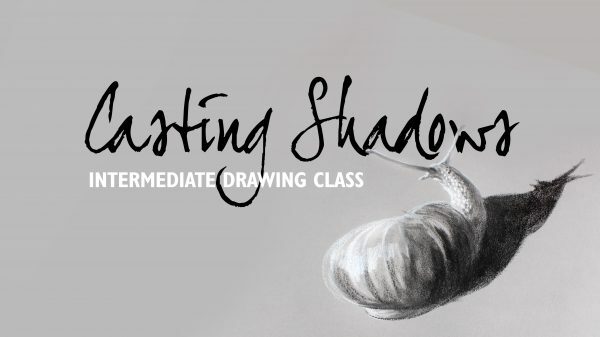 This class is going to help those who create their own art to use shading in new ways! Early in the class, we’ll go through the “math”ish portion of the lessons, learning the technical way to triangulate the light. But I’m an artist, and encourage learning simply how to make shadows believeable! The course can be taken in any medium; making sketches in a sketchbook is highly recommended to internalize the lessons. You can create more finished art pieces too – all in whatever media you wish. Demos are done in graphite pencil, Conte pencil (with white pastel pencil on toned paper too), watercolor pencil (black), and black pen. You can watercolor your sketches, or do them in Copics – anything at all will be great! If you have taken the Drawing 101 prerequisite, you may well have all the supplies needed! The course is discounted until February 10th, 2019, just sayin’! 🙂 Click on the photo below or right HERE to sign up! 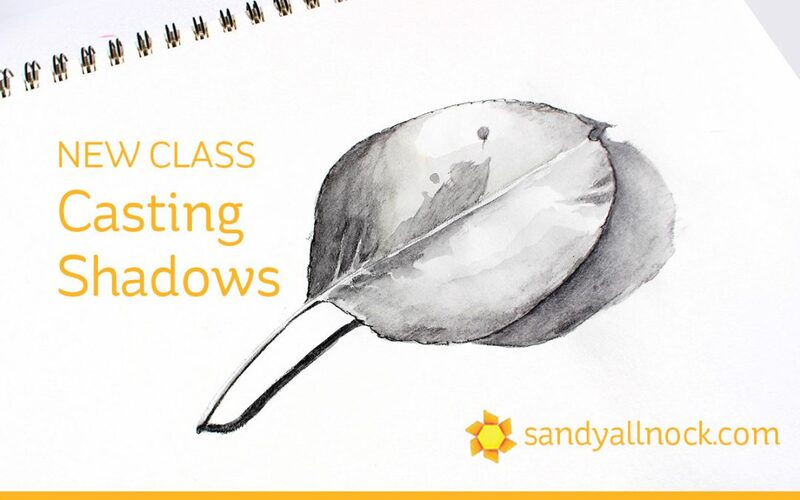 You are so talented Sandy … I am one of those who says they can’t draw or shade … so I think I definitely need Drawing 101 first!! Wow Sandy you are a busy woman. The class looks great and I will certainly keep it in mind. Thank you and have a great weekend. I so want to do this class, but I thought I would go back and work on Drawing 101 again. But then I saw it’s discounted. I like discounts! So I’m getting it now! It might sit a while before I get to it, but hey, it’s not going anywhere, right?